With the apparent death of Grant Ward taking place last year, Agents of S.H.I.E.L.D. was desperate to up its game. The previously announced Inhumans feature film was sidelined, Agent Carter was cancelled, Marvel’s Most Wanted never had a chance to air its pilot, while S.H.I.E.L.D. has been slipping for three years in total viewers. Rumors have been circulating that this year may be the last for the first TV show based within the Marvel Cinematic Universe. Something drastic had to be done. Enter the Spirit of Vengeance. The rights to the character from Columbia Pictures’ movies expired and reverted back to the MCU. 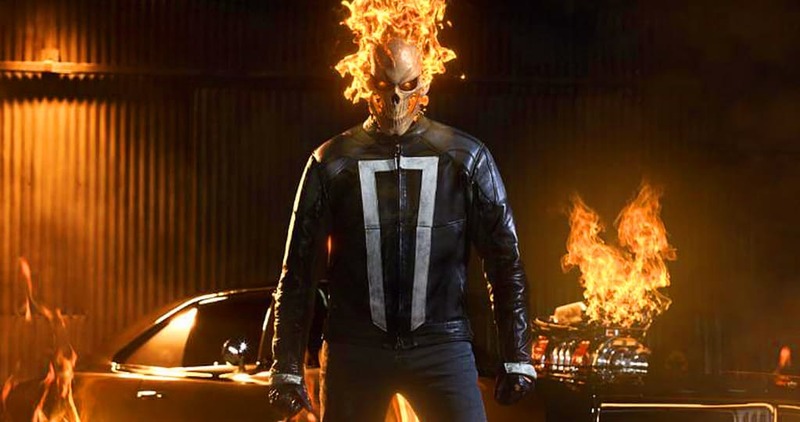 But this time, the Rider isn’t Johnny Blaze, it’s Robbie Reyes and his ’69 Charger. Apparently, when the Rider burns you, it burns your soul and you can never heal. The vengeful spirit has been classified as a serial killer, hunted down by both S.H.I.E.L.D. and Quake (who has gone rogue). Reyes makes a brief appearance, but will most likely appear in multiple episodes, throughout the season. Filling out the episode, Dr. Holden Radcliffe reveals AIDA, along with his Life Model Decoy theory. Yo-Yo puts the moves on Mack, Simmons is now a SADIST, Coulson has been demoted (while the Director has yet to appear onscreen), May might be infected by a contagion and the core group of S.H.I.E.L.D. has been separated, once more, which is never good for the overall storylines in the show. The episodes that include each of the teammates working together seem to be better written that those that feature them apart. Season 4 feels promising and the season premiere episode, The Ghost, was a good start. Here’s to hoping it only gets better from here. We’re hoping it’s a devilish ride.